I've made a couple of very small changes; download links have been updated. - I've added a new "progress" mode in addition to the "silent" and "verbose" (default). 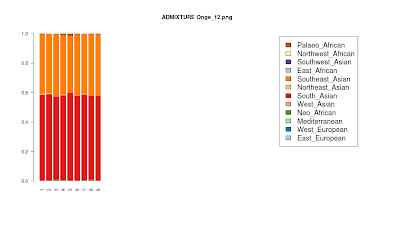 The "progress" mode shows the temporary solutions as the program is running, so they might be fun to see how the admixture proportions converge to the final solution. 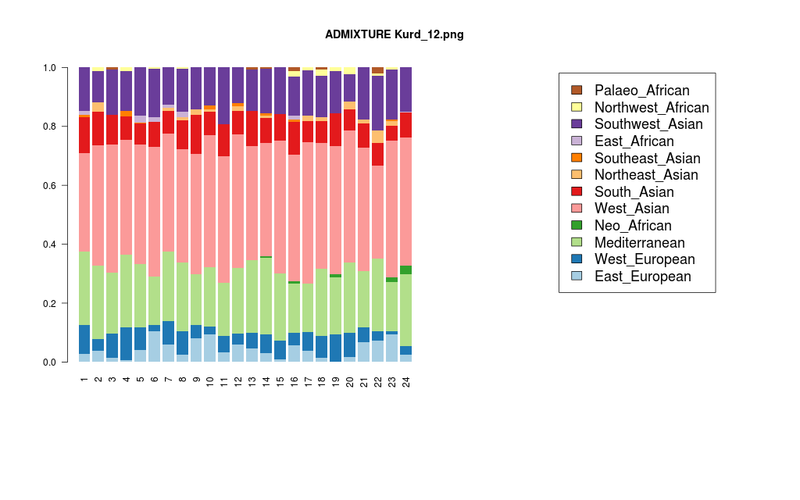 A thing to note is that if the admixture proportions appear to stay the same in successive iterations, they do not necessarily stay the same. For example, a printed 0.23% in the temporary solution may be slowly changing from 0.23001% to 0.23002% etc. With the default convergence criteria it is guaranteed that the final solution will be very close to the one received if you let it run forever. If you downloaded the rar file for DIYDodecad v 1.0, note that it was missing the standardize.r file. This has now been added, and you can download it again; you only need to get the standardize.r file, not the entire rar archive. You need a Windows or Linux 32bit/64bit machine to run DIYDodecad. The instructions should be easy to follow, but if you encounter any bugs or have any problems, feel free to leave a comment or write to me (dodecad@gmail.com). Of course, I will continue to ask for people to send me their data in the future: the calculator is made possible in part because of their contributions. Project participants have added benefits, such as the more specialized Clusters Galore or regional analyses. 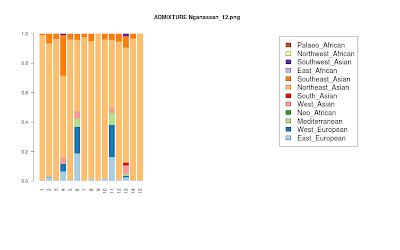 If you are a project participant, you can still try DIYDodecad; you will get slightly different results than the ones you already have, because DIYDodecad does not use the same "random seed" as ADMIXTURE, and has a different default convergence criterion (maximum log-likelihood change of 1e-6 between successive EM iterations). You will also need the program in the future, as more "calculators" will be disseminated for it. So, if you don't want to/can't join the Project, you can still get your Dodecad v3 results; you can also try the Dodecad Oracle with them. Also, feel free to leave a comment in this post with your results. 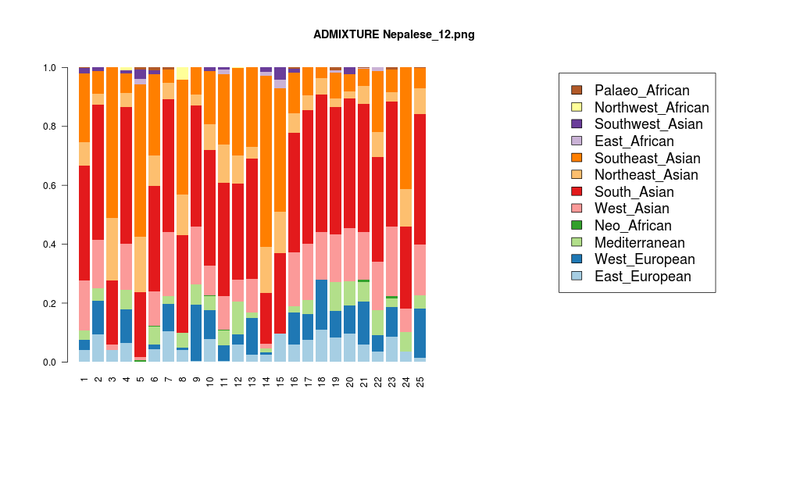 Here is a little fun tool that tests the Dodecad v3 admixture proportions of an individual against all the reference populations, but also against the best pairwise combinations of these populations. You will see a list of 227 populations. You can use these population IDs in the next section. Which populations are closest to a particular population? Which populations are closer to a particular individual? Once again, you can specify k=30, if you desire the 30 top matching populations instead of the default 10. You use mixed mode by adding mixedmode=T in any of the commands. The program then considers all pairs of populations, and for each one of them calculates the minimum distance to the sample in consideration, and the admixture proportions that produce it; population pairs where the distance to one of the two populations is smaller than to any admixture of the two are ignored. [2,] "84.8% Pakistani + 15.2% Urkarah" "1.075"
[3,] "84% Pakistani + 16% Stalskoe" "1.1555"
[4,] "63.9% TN_Brahmin + 36.1% Urkarah" "1.6669"
[5,] "32.4% Urkarah + 67.6% Meghawal" "2.3516"
[6,] "56.3% INS + 43.7% Urkarah" "2.4901"
[7,] "11.5% Adygei + 88.5% Pakistani" "2.6245"
[8,] "82.4% Sindhi + 17.6% Stalskoe" "2.6318"
[9,] "62.9% AP_Brahmin + 37.1% Urkarah" "2.7322"
[10,] "11.2% Lezgins + 88.8% Pakistani" "2.7749"
The mixed mode should be used with caution, and it shows, more than anything else, how similar apparent "mixes" can be achieved by different combinations of ancestry. Nonetheless, it may prove somewhat useful. For example, there is a suggestion in the above results, that Pathans can be viewed as a mix of other South Asian populations and populations from the eastern Caucasus, a suggestion that was arrived at independently by the Project using different methods. [2,] "83.9% Armenians_16 + 16.1% Yemen_Jews" "1.7829"
[3,] "89.1% Armenian_D + 10.9% Saudis" "2.1624"
[4,] "84.3% Armenians_16 + 15.7% Saudis" "2.2884"
[5,] "88.9% Armenian_D + 11.1% Yemen_Jews" "2.2983"
[6,] "83.8% Armenian_D + 16.2% Bedouin" "4.1579"
[7,] "72.2% Armenian_D + 27.8% Syrians" "4.1841"
[8,] "23.4% Georgians + 76.6% Iraq_Jews" "4.2418"
[9,] "76.2% Armenians_16 + 23.8% Bedouin" "4.332"
[10,] "61.5% Armenians_16 + 38.5% Syrians" "4.4019"
This reaffirms the close relationship of Assyrians to Armenians that has been noticed in the project and by others, and it also shows that Assyrians differ from Armenians in a Southwestern Asian direction, consistent with their Semitic language. [2,] "81.3% Hausa + 18.7% N._European" "2.3891"
[3,] "18.4% Orkney_1KG + 81.6% Hausa" "2.4031"
[4,] "18.5% Argyll_1KG + 81.5% Hausa" "2.4268"
[5,] "18.4% Orcadian + 81.6% Hausa" "2.4657"
[6,] "80.5% Igbo + 19.5% N._European" "2.5031"
[7,] "80.6% Brong + 19.4% N._European" "2.523"
[8,] "18.6% CEU + 81.4% Hausa" "2.5938"
[9,] "19.1% Argyll_1KG + 80.9% Brong" "2.6197"
[10,] "19% Orkney_1KG + 81% Brong" "2.6274"
I don't know that much about the slave trade, but I believe that Ghana was an important part of it? [2,] "7.9% French_Basque + 92.1% IBS" "0.8713"
[3,] "68.9% IBS + 31.1% Spaniards" "1.0377"
[4,] "98.8% IBS + 1.2% Irish_D" "1.2959"
[5,] "1.2% British_Isles_D + 98.8% IBS" "1.3018"
[6,] "1.2% British_D + 98.8% IBS" "1.3019"
[7,] "99% IBS + 1% Norwegian_D" "1.3046"
[8,] "1.2% Cornwall_1KG + 98.8% IBS" "1.3048"
[9,] "98.8% IBS + 1.2% Kent_1KG" "1.3142"
[10,] "2.2% French_D + 97.8% IBS" "1.3179"
This completes the results for all Project participants who joined during the latest submission opportunity. The population averages are finalized -for the time being- but I will occasionally update the _D populations as more participants join the Project and/or I discover cases of fraud in terms of ancestry self-reporting. The Onge from the Indian Ocean are outside the area covered by the populations used to create the Dodecad v3, and show mixed "South Asian", "South-East Asian" affiliations. They are probably a good example of case #4. I have long noticed that all Indo-Iranian populations possess some of the "South Asian" component. 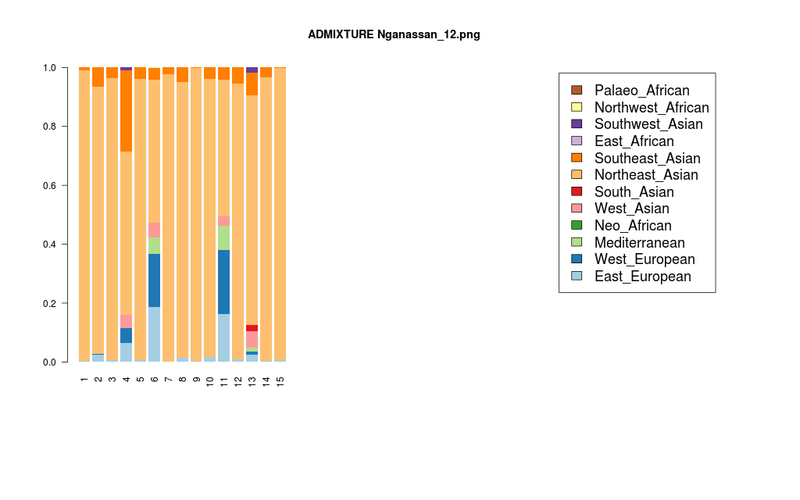 The origin of that component is difficult to ascertain, as it is a composite of "North Indian" and "South Indian" ancestral components, related to West Asians and Onge respectively. What also seems interesting is that the "South Asian" component is closer to the "West Asian" one with respect to all other West Eurasian components, while many South Asian individuals have substantial levels of the "West Asian" component itself. The occurrence of "South Asian" in non-negligible levels seems to track the Indo-Iranian world quite well: it is found at about 1/10 in Iranians and Kurds, and also occurs widely in Central Asia, where its true ancient levels were probably much higher due to the substantial presence of east Eurasian elements in the area today. It even occurs at non-trace levels in people who have been part of historical Persian empires such as those from the eastern Caucasus (compare Lezgins and Azerbaijan Jews with Georgians and Adygei, and Iranians/Kurds with Turks, Cypriots, Syrians, and Armenians). 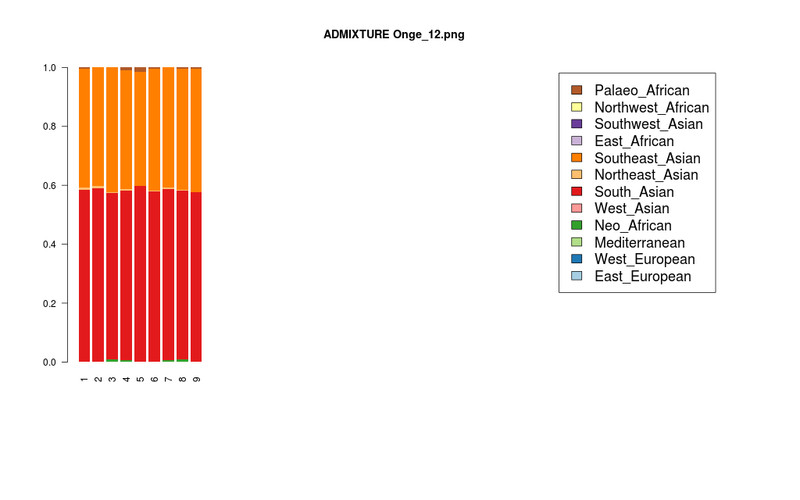 These patterns can be well-explained, I believe, if we accept that Indo-Iranians are partially descended not only from the early Proto-Indo-Europeans of the Near East, but also from a second element that had conceivable "South Asian" affiliations. The most likely candidate for the "second element" is the population of the Bactria Margiana Archaeological Complex (BMAC). The rise and demise of the BMAC fits well with the relative shallowness of the Indo-Iranian language family and its 2nd millennium BC breakup, and has been assigned an Indo-Iranian identity on other grounds by its excavator. As climate change led to the decline and abandonment of BMAC sites, its population must have spread outward: to the Iranian plateau, the steppe, and into South Asia, reinforcing the linguistic differentiation that must have already began over the extensive territory of the complex. In their westward march, the Iranians would acquire an excess of West and Southwest Asian components (which would reduce their "South Asian" one), while in their southward march, the Indo-Aryans would acquire an excess of the South Asian component (which would reduce their "West Asian" one).